Jet Nightclub Las Vegas From the creators of the ultra-exclusive Light nightclub at the Bellagio hotel and casino, comes the much anticipated Jet. Jet nightclub is one of the hottest dance spots in Las Vegas. At over 15,000 square feet, you can think of Jet as Light on steroids. It has clearly made its presence felt in the Las Vegas nightlife scene. 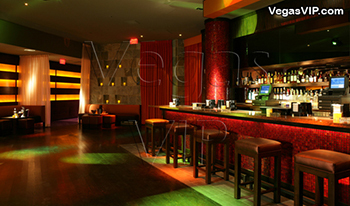 Located at the revamped Mirage resort, the nightclub is conveniently situated close to the north valet entrance. Lines outside Jet nightclub easily wrap all the way past the hotel registration desk to the main valet. 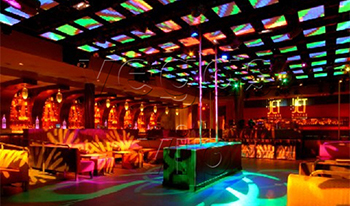 Once inside the club, you notice the size of the main room and the centrally located dance floor. The dance area is quite large compared to most Las Vegas nightclubs and is lit up by over a hundred graphic display cubes aligned in a grid overhead. The varying colors pulsed through the displays, combined with the music, have a hypnotizing effect that attracts dancers like moths to a light. The main room's dance floor is framed by large VIP booths and is considered prime "real estateEfor those wishing to do bottle service. Also on the ends of the dance floor area are more VIP booths on elevated stages with beautiful go-go dancers there to entertain. The rest of the space is flanked by two large bars that are always packed with thirsty club goers. Jet's main room plays mostly top-40 and popular dance music unless there is a headlining DJ in-house. For those with different tastes, one merely accesses one of the side lounges. One lounge is designated the Rock Room and generally plays "mash-upsE which are a clever and catchy combination of rock beats with hip-hop vocals mixed in. Think of 50 cent rapping to a Nine Inch Nails sound track. The Rock Room comes complete with its own bar and VIP seating. The other lounge is called the House Room and its sound is all house music. It too possesses its own bar and bottle service area. One feature that is an asset to the popular hotspot is the staff. They work hard every night to ensure all guests are treated like royalty. From the security staff to the gorgeous waitresses that you would swear should line the covers of popular men's magazines, there is a definite feeling of teamwork present.All of these things combined with a visually stunning venue, makes Jet nightclub one of the country's best spots to go for a good time.